Finding a new dentist in West Hollywood can be difficult. This is especially true when you have HMO dental insurance. You need a provider who accepts your insurance but also provides the customized care you need to keep your mouth healthy and your smile beautiful. Our Pacific Union HMO dental insurance dentist in West Hollywood welcomes new patients. We begin with a comprehensive dental exam. Dental X-rays may be taken to reveal areas between the teeth and below the gumline. We may also use dental impressions to create your treatment plan. In some cases, we may also perform an oral cancer screening. A medical and dental history will be taken to ensure you have the most appropriate care for your situation. After your exam is completed, we may make recommendations that can help you improve your dental health. We may discuss your dental hygiene routine and personal habits, and we may offer suggestions for treatment. Because we are a full-service dental office, we can provide you with all the care you need in our convenient location. Our Pacific Union HMO dental insurance provider in West Hollywood offers periodontal treatments, tooth-colored fillings, porcelain crowns, dental bridges, dental implants, root canal treatments, dental surgery, Lumineers, orthodontic treatment, Invisalign, porcelain veneers, dental bonding, inlays, onlays and teeth whitening treatments. Your treatment plan will be completely personalized to meet your unique needs, and we will work with you at each appointment to ensure your continued good dental health. We focus on building relationships with our patients that provide them with the tools to create and maintain a healthy, beautiful smile that can last a lifetime. Whether you need a routine dental checkup or a full mouth reconstruction, we can help. 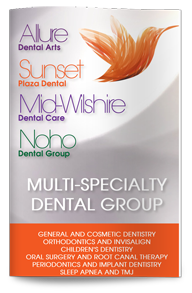 Give us a call today to schedule your initial consultation with our dentist in West Hollywood.